Water filters are important items to have when access to clean drinking water is limited. For example, backcountry camping or traveling through under-developed countries may be situations when you use a water filter. Mountain Safety Research is a corporation that produces an extensive line of camping equipment, including a range of water filter options. In this MSR water filter review, we explain what the equipment is and consider the pros and cons of using it. We also compare MSR water filters to other brands to help you understand key features and differences. This review was developed after researching MSR water filter specifications and reading past customer evaluations. With this information, we developed an honest product review to help you choose the best water filter option for your next adventure. Anyone who is looking for a way to clean water conveniently can benefit from the bottles on our list, whether you are going camping or storing a water filter in the house to prepare for any emergency situations. What Is an MSR Water Filter? There are multiple ways to clean dirty water, including boiling the water or adding iodine pills. One popular and effective way to clean water is by using a water filter. This piece of equipment does not require an additional power source, and typically uses the power of gravity or the force of increased pressure to direct water through a filter that separates particulates from dirty water. The source of the water may range from lakes to streams or from dirty tap water to collected rain water. These filters meet protocols set by the National Science Foundation and can remove 99.9999 percent of bacteria and 99.9 percent of protozoa from extremely dirty water. This microfilter is a popular option with outdoor enthusiasts. Many people appreciate the small size and its ability to pump one liter per minute. Clean water is produced after dirty water is hand pumped through the Marathon EX carbon/ceramic element by an AirSpring Accumulator. 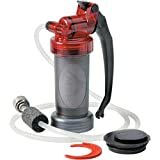 The MiniWorks is a good option for anyone who needs a compact and efficient microfilter to use when away from base camp. 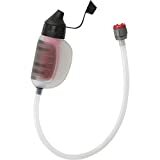 The TrailShot uses the same pumping method as the MiniWorks microfilter. The main difference between the two is size, as the TrailShot weighs 5 ounces while the MiniWorks weighs 1 pound. The MiniWorks is typically used to fill water containers, while the TrailShot can perform this function or simply be used to drink directly from an outdoor water source. It is a good option for trail runners and mountain bikers. The gravity filter uses a different filtration method than the microfilters described earlier. Instead of using a hand pump, the AutoFlow lets mother nature do the work for you. There are 2- and 4-liter system options. Simply fill the dirty water bag and connect it to a water storage source. Hang the bag above the second source, and let gravity pull it through the filter medium. This is a good option for groups of people to have at base camp. The HyperFlow filters water with a pump mechanism. Like the TrailShot, it uses a hollow fiber filter medium. This microfilter is light and highly efficient, making it a great option for individuals on long excursions away from base camp who need access to clean drinking water. Some users had trouble with backwashing, while other hikers and hunters appreciate the small size. 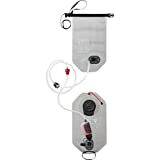 This kit includes the gravity filter, a pocket-sized filter and a reservoir for transporting cleaned water. It is the most flexible option offered by MSR and is a great piece of equipment for anyone planning to make longer day trips away from a set base camp. Previous users appreciate its versatility and how easy it is clean. Along with these water filter options, MSR also offers water purifications systems that combine water filtration and purification techniques such as purifying tablets. The brand also sells filter replacements and equipment repair kits to help the equipment last as long as possible. Each MSR water filter option varies in size and water pumping capability. When selecting a filter, consider how much you value filter speed, size and weight. People who are moving quickly and are filtering water away from camp would benefit from a smaller filter, while individuals with a camping group of three or four people would benefit from a larger filter. Clean water from the filters can be used to fill hydropacks and water bottles or to cook and clean at the end of the day. The MiniWorks microfilter is one of the most popular MSR water filters. Here, we compare it with two similar filters offered by two other brands. 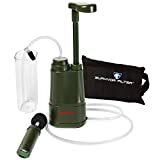 At 11 ounces, the Katadyn Hiker Pro weighs less than the MSR microfilter, but both options pump at 1 liter per minute. The MSR has a longer predicted filter lifespan of 2000 liters while the Katadyn has a recommend life usage of around 1135 liters. The Katadyn uses a glass-fiber filter as opposed to the ceramic and carbon filter of the MSR. Both Katadyn and MSR are high-quality water filter options that have replaceable filter components priced between thirty to fifty dollars. Past users prefer the speed of the Katadyn and the filter cleanability of the MSR. Katadyn also offers SteriPEN, gravity and drip technology filtration options. This filter is the least expensive of the three brands. Like the MSR, the Survivor can filter up to 2000 liters until parts need to be replaced. Previous users commented on the speed of the Filter PRO, making it comparable to the Katadyn. The Survivor Filter PRO is also the smallest of the three, weighing in at 8 ounces and a length of 6.5 inches. It also has a unique triple filter system including a pre-filter, carbon filter and micron internal filter. While the brand does not offer gravity technology like MSR and Katadyn, it does offer direct drinking options similar to LifeStraw. The MSR water filter is an excellent option for anyone looking for an effective and safe way to produce clean drinking water. As seen in our MSR water filter review, MSR produces a variety of water filter designs from which to choose. Other companies, including Katadyn and Survivor, also offer filters that function with a hand pump. This type of technology is ideal for anyone gong backcountry or traveling in places with unreliable drinking water. The main concern we have with the MSR water filter is how often it needs to be cleaned. When the filter is not cleaned, the pump cannot produce water as quickly and effectively. However, this con is balanced by the pro that it is easy to clean. Users comment that the MSR filter is one of the easiest to clean, and that this helps the filter last longer than Katadyn filters. While the MSR does not have a triple filter system like the Survivor, it is still a reliable option that has provided water for numerous outdoor enthusiasts. Remember to replace the parts on your water filter when the recommended time approaches. Even if the water still looks clean, because some unhealthy particulates may have snuck into the final water container. An up-to-date and well-maintained filter is an important step towards water safety. 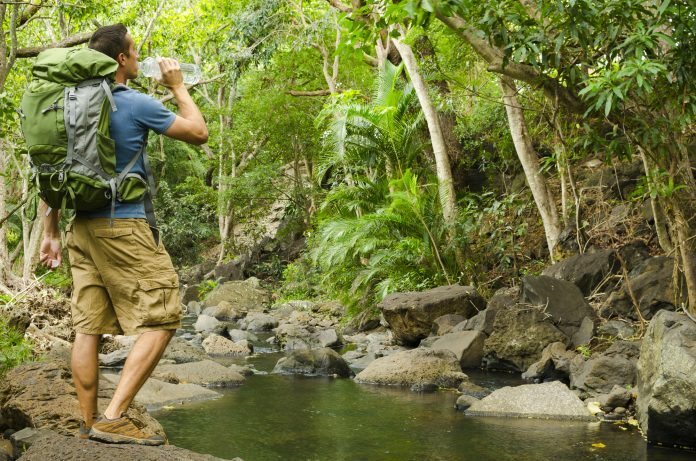 If you are traveling in a region particularly prone to water viruses, consider exploring the water purification options offered by MSR. Filters protect against bacteria and protozoa while purifiers use an additional layer of cleansing to protect against viruses. MSR water filters are on the higher end of water filter prices. Families or individuals camping where there is already access to clean, fresh water should not worry about purchasing a filtration system. Before purchasing a water filter, consider where you are going and what your resources will be. Let that information shape your decision to purchase a filter. After purchasing the equipment, read the directions carefully and be ready to use your new water filter as effectively as possible. The size of MSR Water Filter is perfect for day trips in rural or urban wilderness. It is very easy to use with its pump by hand mechanics. The warranty of 3 years is also a big pro for this product. Though there are a few reviews stating that they have problems with back flow on this product but should easily be addressed by cleaning the filters. 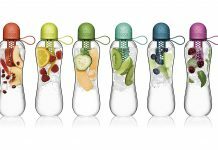 Bobble Water Bottles: Does One Deserve a Spot in Your Cup Holder?